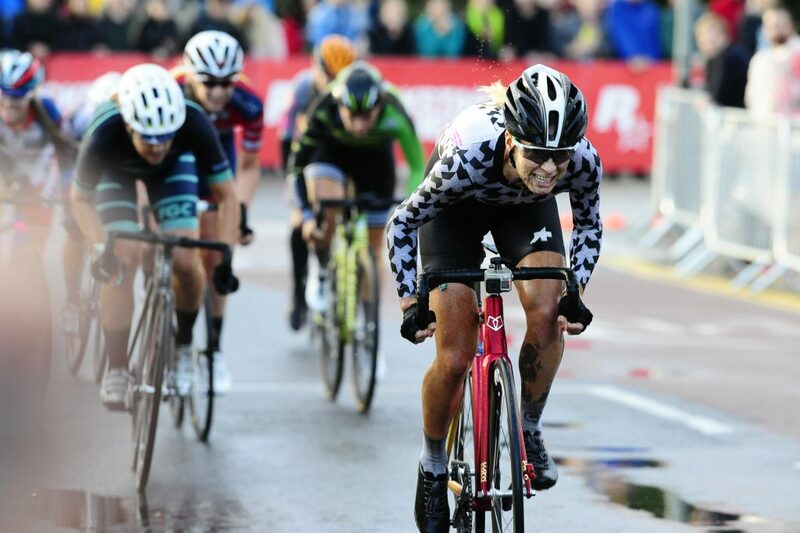 Whereas Red Hook Crit London 2016 will forever be known as ‘the one that Dani King entered’ this year will be legendary for another reason – the atrocious weather. As it happened Dani King MBE (Olympic Gold medalist and team Wiggle Honda rider) turned up again this year but we were far too busy worrying about riding in torrential rain than we were about what she was up to. Despite being the hardest races that I do each year (or perhaps because they are?) the Red Hook Crit are my favourites and though Barcelona is the absolute best (we spend the week preceding riding the outdoor velodrome and lounging on the beach) London is really special as it was there two years ago that I really got into this whole fixed gear crit malarky. In the run up to the race, Dave spent an enormous amount of time checking the weather forecast for London and fretting about the likelihood of it being wet, racing in the rain being a real pet hate of his. He’d also checked out exactly who his competition were likely to be, scrutinised who was in his heats and had a good long think about his race tactics. My approach to racing is slightly different, I prefer to turn up not knowing what to expect and without any prior knowledge of who I’m racing because I like to minimise any time spent worrying. London bound! Heard that @spinonthese has a fancy new set off super light wheels for me to race @redhookcrit on so I’m gonna swap these out tomorrow. As I’m doing it on the day I’ll be running tubes rather than tubeless but I’m sticking with the @iamspecialized S Works Turbo tyres. Completed the set up with a @factory5 chain ring that I stole from @dave_noakes. ? Of course, I always check the forecast before I leave so that I know what to pack and it was at that point that I got concerned about the rain, but largely because I was worried about being cold. I have quite bad circulation, feel the cold and suffer from Raynaud’s that makes my extremities go numb and look alarmingly dead. There was an incredible thunderstorm the night before the race but we woke to dry skies the following morning and headed off to Greenwich via the Thames riverboat. Before leaving, I switched my wheels back from tubeless to tubes as I’ve only one pair of Specialised S-Works Turbo tyres and I wanted to put them on the new Spin On These wheels I was picking when I got to the venue – I figured it would be easier to just switch tyres and tubes between the two rather than faff around with sealant on the day. Once at the O2 there wasn’t a huge amount of time before the course recce so I just jumped straight on to have a look at what we’d be racing later. The course was actually the 2016 course backwards so there weren’t any great surprises. We were still riding through a building site – do they ever stop building stuff down there? A couple of laps in, just as I passed the entrance/exit point of the course, the skies rumbled and we were treated to a torrent of rain – by the time I got back to the exit a mere lap later I was completely drenched and made haste for my buddies NLTCBMBC and their gazebo. My next stop was Costa where I hunkered down with a large cup of tea whilst my fingers returned to their normal hue. A couple of boring hours later (a stark contrast to the usual Red Hooks which are spent larking about with your mates) I donned my kit and hopped on the rollers to warm up for the qualifications. This year’s Red Hooks use a different format to the previous ones in that you have a twenty minute race as your qualifier, which depending on the pace can definitely mess up the legs for the main race later in the day. Knowing this, I’d been doing plenty of training over the last couple of months to prepare plus I’d tapered (where you ease off on training) for the week before so I felt pretty good. Out on the course, I lined up with the other thirty or so women in my heat, feeling the chill in my jersey as I’d surrendered my jacket in anticipation of the start. Right on cue, the thunder rumbled and the rain began lashing down in the kind of way that makes people scream and run for the nearest bus stop or doorway to hide in. 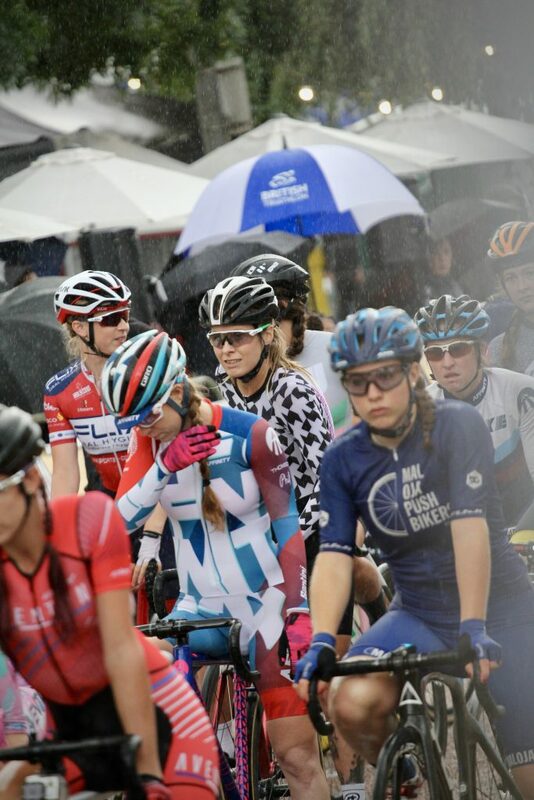 Luckily, I’d raced in appalling conditions in the Tour Series (in Bath) and at a local crit earlier this year so I didn’t actually mind too much. Once riding around, it became increasingly difficult to see as we rode though muddy puddles whilst the rain pelted our glasses. Someone slipped off pretty much right away which made everyone (more) cautious but after the first couple of slow laps the pace started to creep up. It’s hard to know what happened behind me but as I was in the lead group but I think the rain messed with a few people’s heads and the field became strung out when this happened. Racing is always a game of calculated risks, none more so than in the rain so I spent the rest of the race happy to stay put rather than risk moving up. At the back of my mind there was also the thought that if I didn’t qualify for the Super Pole (the top ten from each group qualify for an individual TT that determines your start position in the main race) I wouldn’t have to get wet again before finals! Straight after the race, my only though was of getting out of my wet clothes and trying to warm up before I caught a chill. In some truly wonderful forward planning, I’d booked a hotel nearby so I hotfooted in to the Holiday Day in and jumped straight in the shower. As it happened, I did qualify for the Super Pole but due to the terrible conditions (and surely the fact there was ZERO shelter from the elements for any of the athletes without team gazebos) David (Trimble) decided to cancel it. I rejoiced and brewed another cup of tea. Warm and dry, I headed back to the event a couple of hours later in my skinsuit ready to race. As I mentioned, I prefer not to dwell on who I’m racing but it was hard not to think about Dani King and wonder about whether she’d ride off and lap the field like she did last year. As there are so many other strong riders now, several of whom race as full time professionals (and others such as Ash Duban who are just so incredible yet still work full time) I had no idea how the race would pan out. If she went out as hard as she did in 2017, I reckoned she wouldn’t get away as everyone would be expecting it but I had no idea whether I’d be able to hold on to anyone chasing her down. Certainly, I couldn’t chase her down myself! As it happened, I did manage to stay towards the front, though there were many ‘accordion’ moments where our group strung out in the straight and regathered in the corners. As the race progressed, I’d cemented the idea in my head that I wan’t actually going to lose the group, in fact I could do with moving up and securing a better position so I began gradually making my way forwards. The weather was so horrendous that yet again, we couldn’t see that clearly but we could see enough to ride a course that we’d familiarised ourselves with so it didn’t bother me too much. The main thing you had to be aware of was the fact you couldn’t corner at your usual speed as your tyres would be less able to grip at an angle. 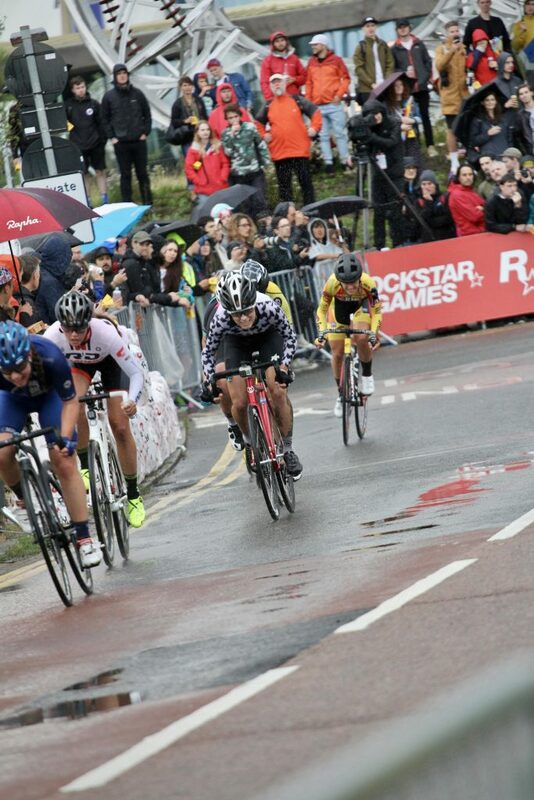 Having fallen off in the Tour Series in Bath, moving up after a corner in the rain, I made sure not to put the hammer down properly until my bike was vertical again. I tried to find places to move up further so I was in a good position to sprint when we got to the finish. With the conditions being so bad, it was hard finding safe way/places to do this – I would rather finish further back than endanger someone else. Sadly, not everyone feels the the same way and one particular woman came swooping around me and cut in front of me as I was on the inside of a corner. I had nowhere to go but thank god, was able to slow suddenly so she could go through in front of me. It was such bad form, so dangerous and not the first time she’s done it to me – she did it to me and various others at the Nocturne. Girl, if you’re reading this, quit racing like that! As we came into the last couple of laps, it was game on and sitting in the lead group I started trying to figure out my strategy for the final sprint. Trying to think straight, remain calm and race at high speed when you’re fatigued is tough. As I came into the final corner before the finishing straight, all of a sudden there were bikes flying across the track in front of me as women slid off and into the barriers in what looked like a really horrible crash. Truly, it’s hard to know what to do in those situations but with the rest of the field still coming through behind me I just nipped past the fallen bikes and carried onto the finish, ending up in 8th place. After a brief change, I watched the men’s race with a beer in one hand and a protein bar in the other, which ended up being my dinner. After racing hard, cheering loudly at the guy’s race then bellowing over music to my friends at the afterparty, I sounded like a croaky old frog, I was that hoarse. So once again, I was so happy that I’d booked us a hotel room and as I sunk into my soft pillow, I drifted off dreaming of the breakfast buffet.